I had been in the search for the shorts that made a good pairing with everything, and with the short fit and still tailored cut of these Balenciaga ones, the search is now over. I got them a couple of months ago on sale, but since I used them until today, I preferred to take it (together with these Alaïa boots) as a Christmas gift too. Still in love with the extraordinary shape of these shoes. AH-MAAAAAAAAAAAAAAAAAAAAAAAAAAAZING!!!!!WOW!! !THOSE SHOES ARE AS CLOSE TO PERFECTION AS A PIECE OF FOOTWEAR CAN GET!!! 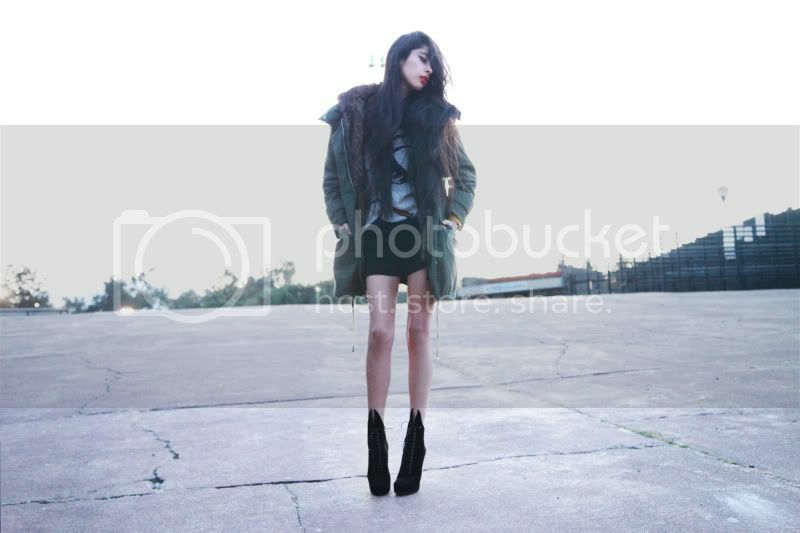 Beautiful boots <3 I love your blog! Amazing! Your legs are impossibly long! The boots are amazing….shape, design, the killer heels!!!! Wow, the shoes are so amazing! Superbe tenue! J'adore comment tu as choisi d'associer cette parka avec ces bottines, absolument magnifiques ! that jacket is so beautiful, love it! wow, the shoes are amazing!! love them. WOWW. you are very fit. i love your legs. fantastic shoes! your legs looks so long! loving your heels! That parka jacket is so perfect!! those boots are super stunningly beautiful! Most perfect boots ever made! Great look! love your parka! Just loving the blog! You look gorgeous and those boots are to die for. Following now on bloglovin. Waiting for the next post! This outfit!! I'm so in love with the parka and shoes!! Dream like booties dear, dream like!!! I simply want to say I am all new to blogging and site-building and absolutely liked you’re web blog. Most likely I’m want to bookmark your site . You absolutely have incredible articles and reviews. Bless you for sharing your web page. My coder is trying to persuade me to move to .net from PHP. I have always disliked the idea because of the costs. But he’s tryiong none the less. I’ve been using WordPress on various websites for about a year and am concerned about switching to another platform. I have heard excellent things about blogengine.net. Is there a way I can transfer all my wordpress content into it? Any kind of help would be really appreciated! Many thanks for this article. I will also like to express that it can always be hard if you find yourself in school and simply starting out to create a long history of credit. There are many learners who are merely trying to survive and have long or favourable credit history can occasionally be a difficult issue to have. Hi, i think that i saw you visited my blog thus i came to return the prefer?.I am attempting to find things to enhance my web site!I assume its adequate to use a few of your ideas!! Hi! I just want to give you a big thumbs up for the excellent info you’ve got here on this post. I will be coming back to your blog for more soon. Good day! I simply wish to offer you a huge thumbs up for your great info you have got right here on this post. I’ll be returning to your blog for more soon. Hi, i believe that i saw you visited my site thus i came to return the desire?.I am trying to in finding things to improve my web site!I suppose its adequate to make use of a few of your concepts!! Hey there! I just would like to offer you a huge thumbs up for the great info you have got right here on this post. I will be returning to your blog for more soon. Hi there, I discovered your website by means of Google even as searching for a comparable subject, your web site got here up, it seems good. I have bookmarked it in my google bookmarks. Hello there, I found your web site by means of Google whilst looking for a comparable matter, your web site got here up, it appears to be like great. I have bookmarked it in my google bookmarks. Hi there, I found your blog by means of Google at the same time as looking for a related matter, your web site came up, it seems to be great. I’ve bookmarked it in my google bookmarks. Wonderful site. A lot of useful info here. I’m sending it to several pals ans additionally sharing in delicious. And obviously, thanks in your sweat! Hello, i feel that i noticed you visited my blog thus i got here to return the prefer?.I am attempting to to find issues to improve my web site!I suppose its adequate to use some of your concepts!! Amazing blog! Do you have any recommendations for aspiring writers? I’m hoping to start my own site soon but I’m a little lost on everything. Would you suggest starting with a free platform like WordPress or go for a paid option? There are so many options out there that I’m totally overwhelmed .. Any recommendations? Cheers! Wonderful blog! Do you have any helpful hints for aspiring writers? I’m planning to start my own website soon but I’m a little lost on everything. Would you advise starting with a free platform like WordPress or go for a paid option? There are so many choices out there that I’m completely overwhelmed .. Any tips? Kudos! Excellent blog! Do you have any helpful hints for aspiring writers? I’m hoping to start my own website soon but I’m a little lost on everything. Would you propose starting with a free platform like WordPress or go for a paid option? There are so many options out there that I’m completely confused .. Any recommendations? Thank you! Superb blog! Do you have any tips and hints for aspiring writers? I’m planning to start my own blog soon but I’m a little lost on everything. Would you recommend starting with a free platform like WordPress or go for a paid option? There are so many choices out there that I’m completely overwhelmed .. Any ideas? Thanks! After looking over a number of the articles on your web site, I seriously like your way of writing a blog. I bookmarked it to my bookmark website list and will be checking back in the near future. Please visit my web site as well and tell me your opinion. I’d must test with you here. Which is not something I often do! I get pleasure from studying a put up that may make people think. Additionally, thanks for permitting me to remark! Hi there, I discovered your web site by way of Google whilst searching for a comparable topic, your website got here up, it looks good. I’ve bookmarked it in my google bookmarks. Hi there, I discovered your site via Google at the same time as looking for a similar topic, your site got here up, it looks great. I’ve bookmarked it in my google bookmarks. Very good blog! Do you have any suggestions for aspiring writers? I’m hoping to start my own website soon but I’m a little lost on everything. Would you suggest starting with a free platform like WordPress or go for a paid option? There are so many options out there that I’m totally overwhelmed .. Any suggestions? Appreciate it! Amazing blog! Do you have any helpful hints for aspiring writers? I’m planning to start my own blog soon but I’m a little lost on everything. Would you recommend starting with a free platform like WordPress or go for a paid option? There are so many options out there that I’m completely confused .. Any recommendations? Kudos! Hi there, I discovered your site by way of Google even as searching for a comparable matter, your site got here up, it appears to be like good. I’ve bookmarked it in my google bookmarks. A person necessarily help to make critically posts I’d state. That is the first time I frequented your web page and to this point? I surprised with the research you made to make this particular submit amazing. Great activity! I am curious to find out what blog platform you happen to be working with? I’m having some small security issues with my latest site and I’d like to find something more risk-free. Do you have any recommendations? Someone essentially lend a hand to make significantly posts I would state. This is the very first time I frequented your website page and up to now? I surprised with the research you made to make this particular submit extraordinary. Wonderful process! Somebody essentially help to make seriously articles I might state. This is the very first time I frequented your website page and to this point? I surprised with the research you made to create this actual submit extraordinary. Wonderful task! I do not even know the way I finished up here, but I thought this submit was great. I do not know who you’re but definitely you’re going to a well-known blogger when you aren’t already. Cheers! Someone necessarily help to make seriously articles I’d state. This is the first time I frequented your web page and so far? I amazed with the research you made to make this particular submit extraordinary. Excellent task! Attractive portion of content. I just stumbled upon your blog and in accession capital to say that I acquire in fact loved account your blog posts. Any way I will be subscribing in your feeds or even I fulfillment you get admission to persistently quickly. Pretty element of content. I just stumbled upon your website and in accession capital to say that I get in fact loved account your blog posts. Anyway I’ll be subscribing in your feeds or even I achievement you get entry to constantly quickly. you are in point of fact a good webmaster. The site loading velocity is incredible. It seems that you’re doing any distinctive trick. Also, The contents are masterwork. you’ve performed a excellent job in this topic! you are in point of fact a excellent webmaster. The web site loading speed is incredible. It seems that you are doing any unique trick. Moreover, The contents are masterwork. you’ve performed a great job in this topic! certainly like your web site but you have to check the spelling on quite a few of your posts. Several of them are rife with spelling problems and I find it very troublesome to tell the truth nevertheless I’ll certainly come again again. We are a gaggle of volunteers and starting a new scheme in our community. Your web site offered us with useful information to work on. You have performed an impressive job and our whole neighborhood will likely be grateful to you. I have been exploring for a bit for any high-quality articles or blog posts on this kind of area . Exploring in Yahoo I at last stumbled upon this website. Reading this information So i’m satisfied to show that I’ve an incredibly excellent uncanny feeling I found out exactly what I needed. I such a lot undoubtedly will make certain to do not put out of your mind this site and give it a glance regularly. Magnificent items from you, man. I’ve take into accout your stuff previous to and you’re simply extremely wonderful. I actually like what you have bought here, certainly like what you’re saying and the best way by which you say it. You’re making it entertaining and you still care for to keep it wise. I can not wait to read far more from you. That is really a wonderful website. Hey there! I’ve been reading your website for some time now and finally got the courage to go ahead and give you a shout out from Atascocita Texas! Just wanted to say keep up the fantastic work! Wow, amazing blog format! How lengthy have you been blogging for? you made running a blog look easy. The whole glance of your site is great, as neatly as the content material! You really make it seem so easy with your presentation however I in finding this matter to be really one thing which I think I might by no means understand. It seems too complicated and extremely extensive for me. I am having a look ahead for your subsequent post, I will attempt to get the grasp of it! Admiring the commitment you put into your blog and detailed information you offer. It’s good to come across a blog every once in a while that isn’t the same old rehashed material. Fantastic read! I’ve saved your site and I’m adding your RSS feeds to my Google account. I just like the valuable info you supply to your articles. I’ll bookmark your blog and check once more right here frequently. I’m fairly sure I will be informed a lot of new stuff proper right here! Good luck for the following! I just like the valuable information you supply for your articles. I’ll bookmark your blog and test again here frequently. I am moderately certain I will be informed many new stuff proper right here! Best of luck for the next! I like the helpful info you supply for your articles. I’ll bookmark your blog and test again right here regularly. I’m fairly sure I will be told lots of new stuff right right here! Best of luck for the following! I just like the helpful information you supply to your articles. I’ll bookmark your blog and take a look at once more here frequently. I am moderately certain I’ll be informed many new stuff proper right here! Good luck for the following! Do you mind if I quote a few of your articles as long as I provide credit and sources back to your webpage? My blog is in the exact same area of interest as yours and my users would genuinely benefit from some of the information you provide here. Please let me know if this okay with you. Many thanks! With havin so much content do you ever run into any issues of plagorism or copyright violation? My website has a lot of unique content I’ve either written myself or outsourced but it seems a lot of it is popping it up all over the web without my authorization. Do you know any ways to help stop content from being stolen? I’d truly appreciate it. Do you mind if I quote a couple of your articles as long as I provide credit and sources back to your website? My blog is in the exact same area of interest as yours and my visitors would definitely benefit from a lot of the information you present here. Please let me know if this ok with you. Appreciate it!